When it comes to your career, do you shy away from the spotlight? Or are you comfortable taking center stage? A lot of admins would rather hide in the corner than have the attention on them. However, when it comes to being considered for a promotion, raise, or exciting company projects, your administrative skills, abilities, and accomplishments must shine! That means you have to put the spotlight on your administrative career in a way that gets you noticed and puts you in front of those you need to reach. But how do you do this? 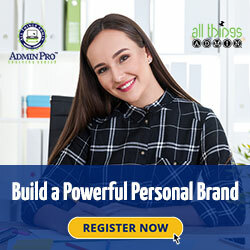 This free All Things Admin webinar will provide some valuable advice and tips about improving your professional visibility. Why you need to showcase your skills and abilities to get ahead. Three key strategies for boosting your professional visibility. How a professional portfolio can propel you into the spotlight and keep you there. Where you can get more free support during our Spotlight Your Career 5-Day Challenge. 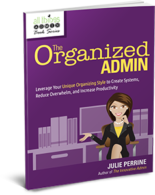 Plus, registering for this free webinar automatically enrolls you in our free 5-Day Challenge! A daily plan of action. 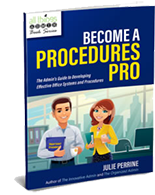 Access to Julie Perrine and her expert team. Don’t let you career stall out! 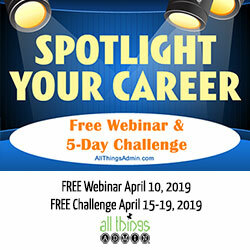 Join us for a fun and productive free webinar and 5-day challenge and put the spotlight on your career!